House exterior, after renovation. The elegant porch configuration improves connection to and from the home and greatly increases the home's "curb appeal." The original house was a traditional Foursquare, but its Mission-shaped roof parapet, oppressive dark porch and interior trim, together with an unfortunate addition did not foster a cheerful lifestyle. The homeowners purchased it despite its architectural shortcomings because of its location within Ridgewood’s Historic District, its proximity to the downtown and commuter train, and their recognition of the house's potential. Views of the home prior to renovation. 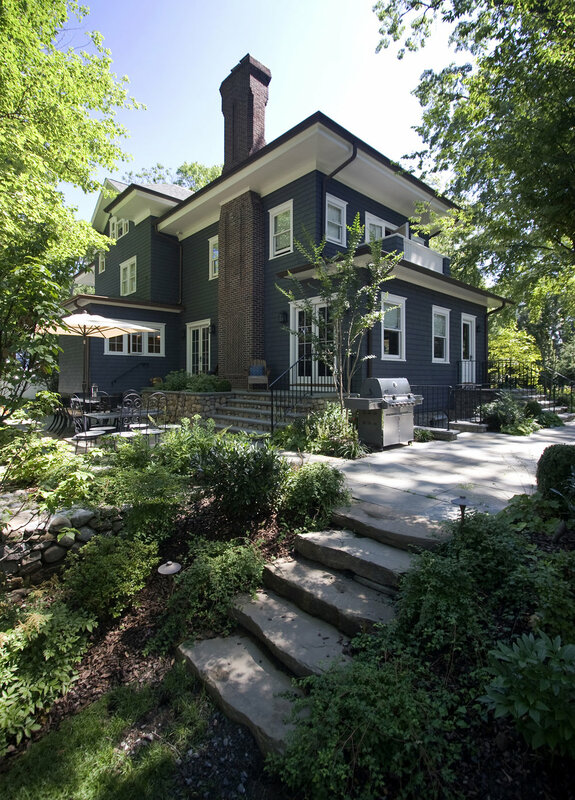 The owners selected Clawson Architects to re-envision the house based on their expert knowledge of period detail. The exterior and landscaping of this 100+ year old home were altered, renovated and given a small addition, all based on the precedent set by surrounding homes in the neighborhood. The interior was renovated and updated to reclaim the inherent beauty of traditional old house living. Pre-renovation view of the front door and front porch. The corner lot posed privacy issues, so Clawson Architects coordinated with a landscape architect to create scenic views to and from the house while enhancing privacy. The property was terraced in order to level the site around the house as well as to maximize the connection of the house to the site. Landscaping terraced to connect house with the property. The stair hall renovation received an AIA Gold Medal Award. 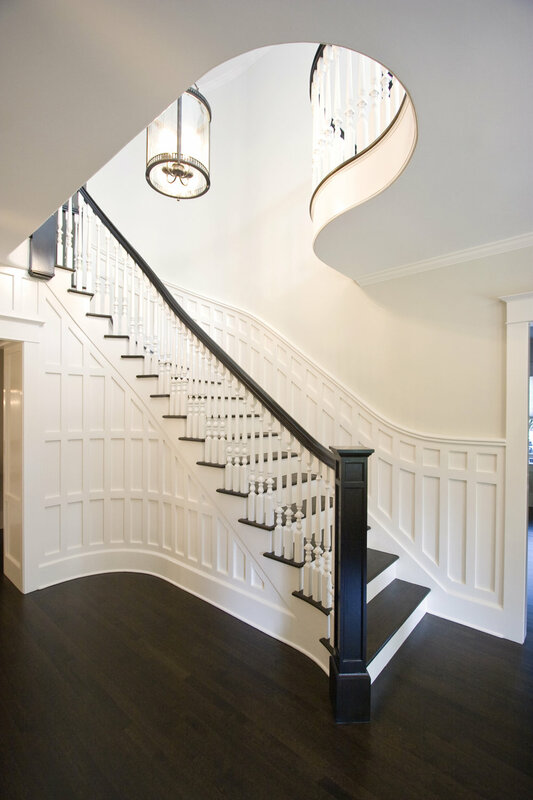 View more about the stair hall project. The view from the kitchen island towards the kitchen table now offers the homeowner commanding visual access to the entry hall, dining room, and family room/library as well as the side mud room entrance. The new eat-in area with custom-designed fireplace was formerly the kitchen workspace and offers a cozy setting in front of the fire. One can now easily circulate thru a wet bar area to the library and study or family room. The kitchen work area was created with a small five foot addition to allow more natural light into the room and greater visual access to the patio and play yard. Material selections include a seven foot wide plank mahogany island, Calcutta gold marble countertops, custom full face frame inset cabinets with glass doors and a custom antiqued zinc hood. New hardwood floors of red oak with custom stain were installed throughout the house as well as custom moldings, wainscots, fireplace mantels and built-in bookcases and window seats. Library: Enlarging the existing opening to flood the space with more natural light while increasing storage with a custom built-in window seat and bookcases has made this area a lovely place to read or just hang out. Mud room: a must-have space to keep this family of six organized! It also has a gracious powder room too. Two large storage closets for off-season coats and boots. Desk and bulletin board keep everyone organized. The master bathroom is a quiet retreat for the owners and part of an elegant master suite. The spacious marble shower and beautiful soaking tub offer escape and relaxation. The master bedroom features a custom-designed fireplace with flat screen television and a balcony that offers sweeping views of the gracious new landscaping. Master Bathroom is a Houzz.com favorite with over 120K saves and everyone asking what color is that on the wall!